The Truth Will Set You Free: Is reassurance really needed.. I'm presenting this information in such a way that all can become enlightened, Information may be delivered by credible researchers in the form of presentations, or disclosed documents, witness and whistle-blowers testimonies, historical event's and recently discovered truth's and archaeological discoveries as evidence. If you cannot find the time to read, watch and educate yourself then you are a lost cause and deserve to remain in the bubble you call reality. will take you everywhere." - Albert Einstein. 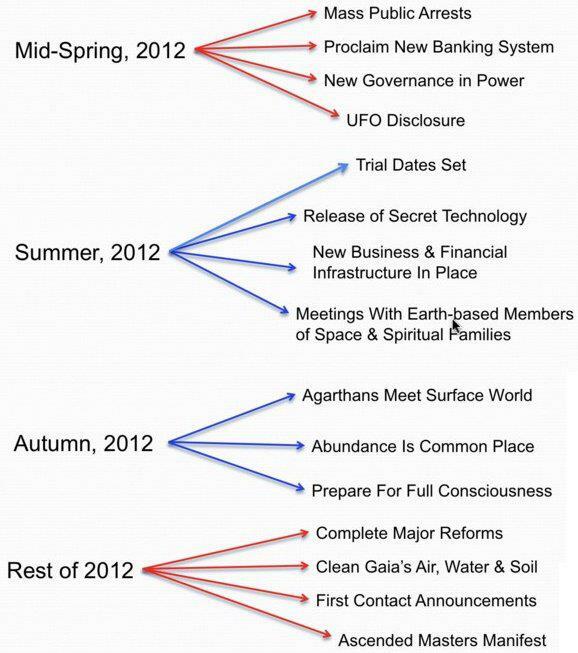 This is a summary of the information from whistle-blowers from the Montauk Project. "Other information on this video is the discussion of various Extra-Terrestrial Bases and the involvement of the Pleiadians in the US and Germany. Reports confirmed by Billy Meier, stated that space-time technology was exchanged by a certain race of Pleiadians with Hitler in Germany during 1933 to 1934. When Nicola Tesla claimed that he was in contact with some races of Extra-Terrestrials, the government asked if it were possible to meet with the Aliens. Tesla said he could arrange it. After the presidents initial shock, they made arrangements to meet with the Pleiadians, and then with the Greys. The Greys offered similar technology in exchange for abducting humans and doing genetic experiments. The US Government decided to work with the Greys and the Pleiadians went to Germany to work out a treaty with Hitler. Hitler got involved when a saucer crashed in the Bavarian Alps in 1936. This was a head start for them when they dismantled the ship and found some new technology. Hitler apparently gave up people from the concentration camps in exchange for technology and that no Germans would be abducted. After several years of working together, the Pleiadians decided that they could no longer work with Germany and pulled out in 1941, and would no longer support Hitler. The video goes on to say that some of the saucer crashes may have been orchestrated as a method of contact to get the higher government interested, and to pull out interest of the keys people. Al explains how Atlantis was destroyed by created international earthquakes, and after which two humans and one from the Reptilian race formed the early secret societies leading to the ultimate development of the Illuminati." David Wilcock explains "Project looking Glass" in the video below, Which gives us some incredible insight into the nature of a "Stargate" and ultimately the foresight of knowing that the future will be the "prophesied golden age", no matter what takes place as of now is irrelevant, Our future is Glorious! I ask you now to answer a question, It's simple but holds weight within your answer, Have you honestly given the information I have supplied your full attention, for all the information paints a brilliant picture, dark in places but undeniably magnificent and liberating, please take the time to read the information and watch the videos, some are short and others can be lengthy but with an open mind you will be gripped within minutes, All of the videos are relevant and do have value. 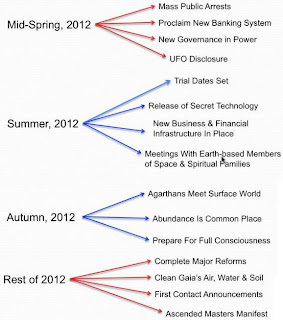 A timeline has been given to us from the Galactic Federation, This is going to be a year of epic proportions, The events mid spring will happen all at once, The mass arrests, The change in the financial system and a new government in temporary power is a strategic operation that is awaiting the green light, all power plants and utilities for the public will be manned by the military and civilians best suited while the transition of global power to the people takes full effect. In a recent update, Tolec goes into detail about the reptilians and there history and agenda, He also explains why the Andromeda Council are stepping in, a reason being is in 300 years some event happens that effects many worlds, This changes the DNA of human beings to a reptilian race, The Draconian Empire has created a vibrational grid throughout the whole milky way galaxy and the big picture is that the whole galaxy becomes a reptilian race controlled by the draconian empire. This has to be the largest forced slavery act ever, The star nations that are stepping in are doing so in pursuit of saving there own fate as well as ours, If we were to enter space controlled by these draconian controlled maniacs, I believe we would dominate space with an iron fist, this explains why we are a prison planet, to why we are being told we have to be spiritual to enter and explore space, makes sense really, the powers that were have done what "they believe" to be there best to there cause of "making earth a better world", I believe they would take this and force it onto other planets just as they have done on earth. Now back down to earth, Kerry Cassidy from Project Camelot interviews Keith Scott below, Keith Scott is one of the principals in the Keenan Lawsuit, Here is a short bio of the interview, I am aware that Drake Bailey makes an appearance in this interview. If I were to choose to listen to only one section, it would be Part 4. (Note: "the Drake" makes an appearance at 3:22 of Part 4). The Galactic Federation have said that an event on earth will be the first domino, This event will be an earthquake but it will be felt and everyone will just say "wow, an earthquake here? ", This will cause those living in a bubble to become aware that something BIG is happening. The Andromeda Council have told us now that a volcano will erupt in just 4 weeks, The volcano is located under the sea and this will cause a deep earthquake and that will in turn create a planet wide ping, This will be a milestone event and an eye opener for many closed minded people. Would you like to know more?, watch this space for an update soon. Feel free to ask a question, If you wish to understand a certain topic of so called "conspiracy theory", I will do my very best to deliver enough truth that it will be accepted as self evident or you will dismiss me as a crackpot and all the evidence as coincidence or propaganda, you can take what I show anyway you want to, weigh it up, see if it resonates any truth to you, that's what I want you to do, open your mind and peek outside the government controlled box we are forced to live within. I'm presenting this information in such a way that all can become enlightened, Information may be delivered by credible researchers in the form of presentations, or disclosed documents, witness and whistle-blowers testimonies, historical event's and recently discovered truth's and archaeological discoveries as evidence. If you cannot find the time to read, watch and educate yourself then you are a lost cause and deserve to remain in the bubble you call reality. I'll never claim ownership of any info here, knowledge is free.. not a commodity.. Awesome Inc. theme. Powered by Blogger.